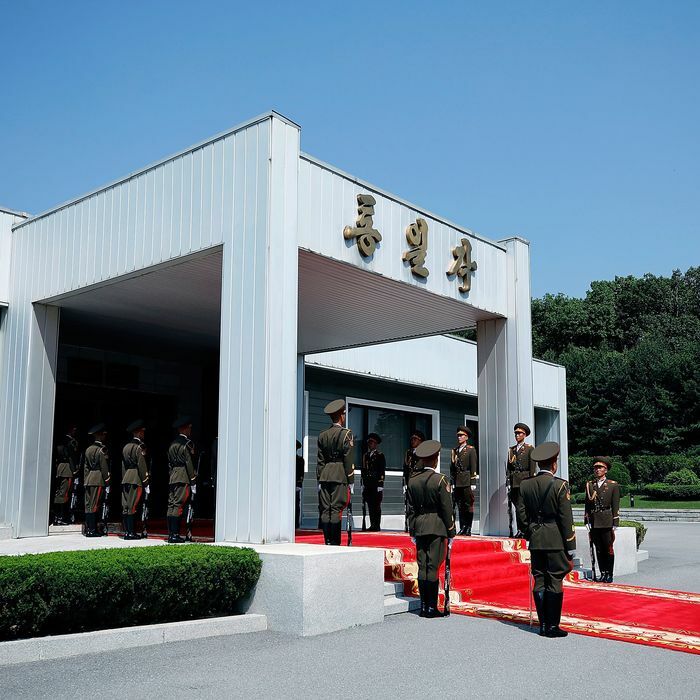 North Koreas soldiers stand guard outside the “Unification House” in Panmunjom on the South and North Korean border. The new preliminary talks are set to continue through Tuesday, and are being led by Sung Kim, a former U.S. ambassador to South Korea who has held nuclear program negotiations with North Korea in the past. Trump’s optimism that the June 12 summit in Singapore will still happen does not mean that it will, however, and even if all sides agreed to whatever it is they need to agree to, there might not be enough time left to get ready. At least that’s what the senior East Asia director on the White House National Security Council, Matt Pottinger, told reporters during a press briefing last week. The president later surprisingly claimed that the media had invented Pottinger, which presumably means that he did not agree with his aide’s assessment that the meeting may not be logistically possible for much longer. On Saturday, there was another, earlier surprise meeting across the border between North Korean dictator Kim Jong-un and South Korean president Moon Jae-in, who did so in the hope of salvaging the summit with the U.S. Moon later claimed that Kim was still committed to “complete denuclearization,” though he did not define what that meant — which has always been a sticking point between the Washington and Pyongyang. But some analysts, like nuclear nonproliferation expert Vipin Narang, are cautiously optimistic about the new talks, since the two sides are more likely to find some common ground now that a seasoned diplomat, Sung, is representing the country, and doing so behind the scenes. “This is how progress is made, and the best chance to have a summit, and one that yields meaningful outcomes,” Narang told the Washington Post — though he and many other experts continue to point out that if the Trump administration expects North Korea to give up its nuclear weapons as part of any deal, they are going to be disappointed.